SS-Oberführer Oskar Paul Dirlewanger was the founder and commander of the infamous Nazi SS penal unit «Dirlewanger» during World War II. He was gravely beaten by Polish guards in French service on the night of 4 to 5 June, 1945, resulting in his death. This officer was notorious for being an extremely cruel character involved in mass murders of civilians in the Soviet Union, Poland and Slovakia, including Belorussian Katyn and other urban villages. He took part in atrocities committed to put down the Warsaw Uprising. The mass killings of Poles in the Warsaw’s district of Wola were prepared and organized. Nazis did not spare anyone. The slaughter of Wola District was performed on the innocent people, who were dragged out of their homes with the whole families. There were the sick, children and babies among them. The massacre took place in yards, bigger squares, streets..., where people were being killed with side arms, machine guns mounted on a platform on the ground, grenades, and even a tank cannon, which people in the corner of Wolska and Elekcyjna streets were killed with. Civil population was murdered home after home, street after street... This holocaust was done during a few days, but reached its climax on the 5th and 6th of August, 1944. When the killing ended, houses would be set on fire. There were many cases of burning people alive in such houses by not letting them to get out. Some part of population were destined to die in a different manner - they were forced to become «human barricades» and «human shields» in order to protect German soldiers while they were attacking the insurgent barricades. Since August 4th Germans introduced into action diving bombers, which were ceaselessly bombing the district. Dirlewanger got an order from Himmler to undermine the morale of the insurgents. Whole families and house residents were eliminated with buildings burnt. In many cases people were prevented from getting outside. In the premises of the orthodox church of St. Jan Klimak in Wolska street Germans committed an exceptionally inhuman crime on orphan children from the Orthodox Orphanage at 149 Wolska street. Only two girls remained alive. Out of all the children from the orphanage two girls managed to survive; they had hidden in a cemetery tomb. They killed also other people who had been seeking shelter in the orthodox church. «We were ordered to leave (from the smaller orthodox church) to the Wolska street. Here, I spotted machine guns set on the railway tracks. We were led to a ditch near the fence. We were ordered to get into the ditch and then a series was fired... They were shooting with a machine gun and small arms. When all fell down, the shooting ended. I fell down, hit in the left arm. A shrapnel hit me in the temple and cheek. When I was lying, I noticed that an unknown man moved and was killed off by them. After checking that everyone were dead, the Germans went away. Then I got up and started to call... No one answered». «On August 5th, 1944, at 10 a.m. in the yard of our home at 129 stormed a German unit. There were a few dozens of them. They were armed in hand machine guns and grenades. The house was large, consisted of over 150 flats and had about 600 tenants... A few bed-ridden stayed inside. I walked out from the flat with my husband, two sons and two daughters. Together with other tenants we were ordered by the gendarmerie to get out to Wolska street, cross the street and stop near the Gen. Jozef Sowinski Park. Men were separated from women and mothers from the sons older than 14 years. We were grouped near the fence of the park, from the park's gate... up to the place where the stone cross stands. As I was standing by the fence I saw that on the corner of Wolska and Ordona streets there was a machine gun on a platform, and near our house, about 10 meters from Ordona street in the direction of Pradzynskiego street there was a second one. I saw also the third one, but I do not remember now, where it was (it was closer to Pradzynskiego street). With those machine guns German soldiers shot series into us... I fell to the ground. I was not wounded. Corpses were falling down on my legs. My youngest daughter, Alina who was lying next to me was still alive. After capturing Wola Germans arranged in the Gen. Jozef Sowinski Park the position of the heaviest self-propelled siege mortar «Karl-Gerät». From there, on August 16th, 1944, they started to shell Warsaw with huge projectiles which weighted 2200kg. The soldiers operating the monster were not concerned at all that in their direct vicinity rested the ashes of thousands of murdered and burned the citizens of Wola. On «black Saturday» of August 5th death sowers worked without rest. Jan Grabowski, who survived the massacre near the blacksmith's at 124 Wolska street, testifies: «...on August 5th, 1944, around 100 German military policemen stormed into the yard of our home at 123 Wolska street and formed a line up to the blacksmith's, which was located deeper into 124 Wolska street, almost opposite our home... 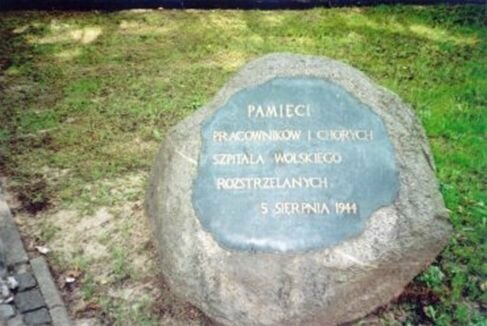 I went out together with my wife Franciszka, 4-year-old daughter Irena and 5-month-old son Zdzislaw Jerzy In the square in front of the blacksmith's all were ordered to lie down on the ground. The group from our house numbered about 500 people. When I got there with my family, people had already been lying on the square. When I was lying, I saw that there is a machine gun mounted on a platform... at the distance of about 5-10 meters. The Germans started to shoot with the machine gun and rifles, and also to throw grenades in the crowd of lying people... After some time the shooting was over and I saw that the Germans brought another group of people... the shooting and breaks for finishing off those still living lasted at least 6 hours... A military policeman walked three times over me, I was not injured, but my wife and children were murdered. I heard a military policeman ordering to kill my 5-month-old son, who was crying, then I heard a shot and the child got silent... I was playing dead... When workers who were carrying corpses came to take also me, I got up and started to carry the dead with them, until the end of the work. We were putting them on two piles... until the dusk. One was about 20 m long and the other 15m, about 10 m wide and about 1.5 m tall... The military police were still accompanying the workers and killing those who survived». «On August 7th, 1944, at 9 a.m., 15 Gorczewska street. Three 4-storey Wawelberg's blocks of flats are surrounded by the Germans from the SS. They throw grenades inside, machine guns are placed all around; no one is let out; they set the house on fire from every side; when someone gets out, there are killed; burned throw themselves from windows, no one can get out of the flame, they are burning alive, only a miracle could help someone leave that place; I know about a woman who jumped through a window from the second floor and survived; the exit is full of the bodies of those who tried to run away from the flames; I saw a woman with a child by her breast among them. Houses were surrounded from all sides. I suppose that there might have been up to 2 000 (two thousand) people in these buildings. No one alive got out of there, except for a miraculous way like the abovementioned woman». I begged the surrounding us Germans to save the children and me. One of them asked if I had something to bail out. I gave him 3 golden rings. He took them, but the officer supervising the execution ordered to join me to the group that was going to be shot... He pushed me so hard that I fell down. He saw I was in the last month of pregnancy. Then he punched my older son shouting: Faster, you Polish bandit!... The children were walking crying... At one moment slaughterer who was standing behind me shot my older son in the back of his head, next shots hit my younger children. Then they shot me. I fell down on the left side. The bullet hit my neck and went through the lower part of the skull, going out through the right cheek. I got pregnancy hemorrhage, and lost a few teeth. German murderers did not spare the hospitals in Wola. There were four hospitals situated not far from each other in the area of Wolska, Plocka, Zytnia, and Karolkowa streets: Wolski Hospital, Karol and Maria Hospital, St. Lazarus Hospital, and St. Stanislaw. Memorial plaque by the Wolski Hospital (fot. J. Mankowska), It is dedicated to the Wolska hospital personnel fusilladed on August 5. «... On August 5th, 1944, the Germans came to the Wolski Hospital again, this time in a bigger number. There were Ukrainians and Georgians among them. Around 1 p.m. a German officer together with two SS soldiers entered the office of the hospital's director, doctor M. Piasecki, who were accompanied by professor doctor J. Zeyland and a priest (K. Ciecierski), the hospital's chaplain. The officer shot them. Right after this murder one of the doctors told me that. Then the Germans spread out in the whole hospital and were throwing the sick from their beds, threatening them with rifles... I was after the operation of stomach. A German hit me and pushed out of the bed on the corridor. I was wearing only pajamas and was barefoot. In front of the hospital there was already a long queue of men grouped in fours: the sick, doctors, nurses, and people who were looking for shelter in the hospital... We were led through Plocka and Gorczewska streets in the direction of district railway... We were brought to the yard of a factory... People were taken in groups, at first the healthy ones, then the sick... We were lined in fours, in groups of 12 people. They took our watches and... we were sure that we are going to die. At that time I was already wearing a cassock brought by a Daughters of Charity nun... The place of execution was a large yard. I was standing there for about 15-20 minutes. I saw how every group of 12 men was executed by shooting in the back. In my twelve there was a woman. She was holding a baby in her arm, which could be one year old. With this child she was shot. She asked the Gestapo soldier to kill her baby first and then her. He smiled, but said nothing. The child was whimpering and crying long after its mother was executed».